CAF audio is not good with most media players or audio altering programming. In spite of the fact that this Core Audio Format is produced by Apple Inc, it is just good with macOS 10.4 and higher, macOS 10.3 necessities QuickTime 7 to be introduced. All things being equal, iTunes iMovie still cannot bolster CAF audio regardless of on what adaptation of the macOS. Let alone to alter or play CAF files on non-Apple gadgets like Windows Media Player, Android telephone, BlackBerry, PS3, Xbox 360 and so forth. With a specific end goal to make CAF files playable or editable on any gadget, a prescribed arrangement is to convert CAF to MP3 or other more prominent audio format. 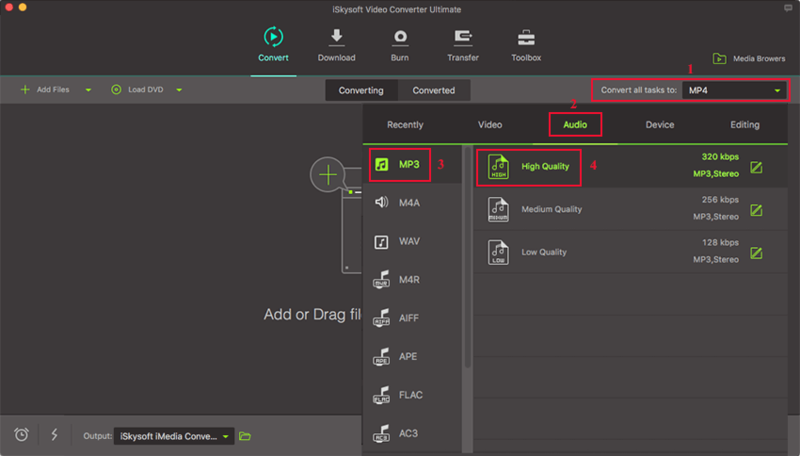 The simplest and by far the best way to convert CAF files to MP3 is iSkysoft Video Converter Ultimate. Here’s why iSkysoft Video Converter Ultimate is such a wonderful tool to have in your arsenal when you are going to be making VR videos and regularly having to convert from one format to another in order to have videos compatible for all your devices that you wish to watch them on. It supports to convert video and audio files to 150+ different formats as you want. It converts distinctive audio/video records in the meantime, fundamentally rearranged the audio/video you have to change over to the program. It is integrated with video editor that trims, crops, rotates, splits, and adjusts volume, saturation, ASR, brightness and adding effects. It ensures the principal picture and audio quality since it wraps up your media records just in another holder while keeping the underlining codec unaltered. It is a dynamic software that allows you to convert audios and video files to your iOS devices, Android devices, and game console such as PSP, PS2 XBOX and others. Step 1: Add CAF Files to the Converter. After the launch of the CAF to the MP3 Converter, import your source files into the program for converting: specifically drag and drop the CAF files to the application, or on the main interface, click "Add Files". Step 2: Set MP3 as Your Output Format. At the base, you can choose MP3 format as the output format under Audio icon. If you're running group transformation, you can redo distinctive output formats for each or set a similar output file format here. Step 3: Begin to Convert CAF to MP3 on Mac. What you have to do here is to tap the "Convert" button and the rest will be done naturally by the instinctive Video Converter. The Core Audio Format is a container for storing sound, created by Apple Inc. It is good with macOS 10.4 and higher, macOS 10.3 requirems QuickTime 7 to be introduced. Core Audio Format is intended to beat constraints of prior established computerized audio formats, including AIFF and WAV. Much the same as the QuickTime .mov container, a .caf container can contain a wide range of sound arrangements, metadata tracks, and a great deal more information. Not constrained to a 4 GB document estimate like more established computerized sound configurations, a solitary .caf file can hypothetically spare several times of recorded sound because of its utilization of 64-bit record counterbalances. Soundtrack Pro and Logic Studio utilize the .caf format widely for their circle and sound impacts library, especially for encompass sound packed with the Apple Lossless (ALAC) codec. CAF is a well-built format used to store audio files. Its limited media players make us convert it into MP3 to play it on other gadgets too. In order to play, open, edit CAF, convert CAF to MP3, a much more versatile and compatible format across operating systems is recommended.